Afternoon session – 1 to 4 p.m.
Skijoring, which translates to "ski driving" in Norwegian, is a combination of cross-country skiing and dog sledding. Your dog wears a harness, you wear a waist belt and connect to your dog with a long bungee leash, and off you go! 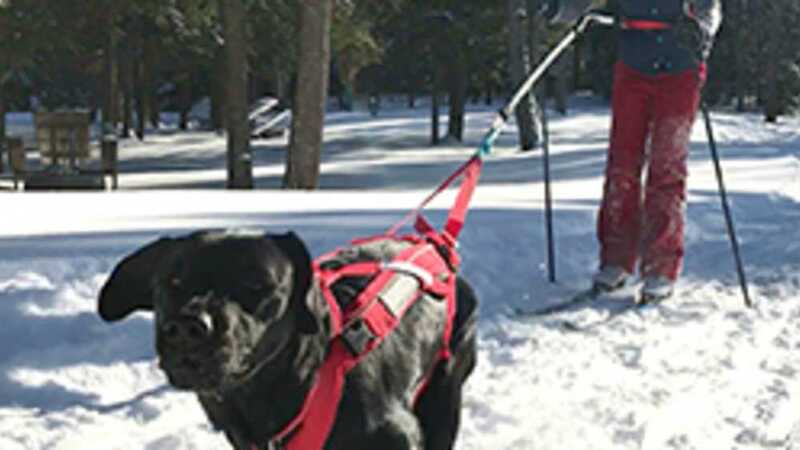 This fun winter sport is a great activity for dogs of any size and is sure to tire out even the most high-energy canine companion. The workshop will cover the history of skijoring, equipment and techniques. Cost is $45 per person. This includes a bungee leash, waist belt and refreshments. Dog harnesses will be available to purchase, or participants may bring their own. Register for Introduction to Skijoring – morning session. Register for Introduction to Skijoring – afternoon session. The entire workshop takes place outdoors, so please dress appropriately. Participants should bring cross-country skis (no metal edges), one dog and proof of up-to-date vaccinations. The registration deadline is March 26. In the event of cancellation, participants will be notified 48 hours prior to the workshop. Limited to seven participants per session. A Recreation Passport is required for entry into Tahquamenon Falls State Park. For more information, contact Theresa Neal at 906-492-3415. Please note: Cancellations must be made by March 16 in order to receive a refund. If you are unable to make the class and are unable to give two weeks' notice, the registration fee is considered a donation to the educational program at Tahquamenon Falls State Park.